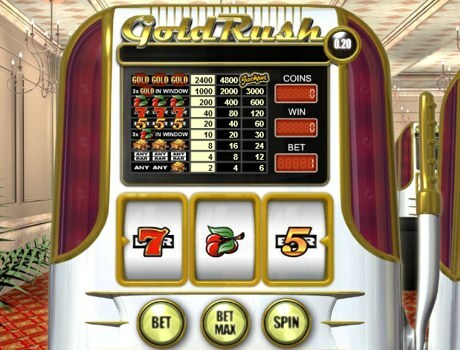 Gold Rush is a classic single line and 3 coin slot machine game featuring a progressive jackpot. Strike gold with Gold Rush! Every player contributes to the jackpot until a lucky winner takes it all. Gold Rush is also available in Flash version, which means it looks better, you can play in full-screen and there are even more functions. The coin denomination is fixed at 0.20 in credits and cannot be changed. You can bet from 1 to 3 coins and the maximum bet is required to qualify for the jackpot payout. There are 9 winning combinations with a classic slot symbols like Cherries, Sevens, Fives and Wheel Barrows full of gold. One of the ways of digging for gold is winning a progressive jackpot which can be won when you hit the 3 Gold Rush symbols on the payline. But remember, you must bet max 3 coins in order to qualify for the progressive jackpot win. With 2 coin bet you'll get 4,800 coins (€960), 1 coin bet will bring 2,400 coins (€480) instead of the progressive jackpot for the same 3 Gold Rush logos combination. The largest Gold Rush jackpot of €277,475.00 was hit by player T. L. on June 06, 2013 at Paf Casino. The Gold Rush jackpot pools are different for each of the Net Entertainment powered online casinos. Visit the corresponding online casino to play for the highest grown (Scored) jackpot.